1 A None No Power Seat 1 A is a Club Business Class Bulkhead seat. The tray table is in the armrest, making the armrest immovable and slightly reducing seat width. There is no floor storage for this seat during take-off or landing. 1 B None No Power Seat 1 B is a Club Business Class Bulkhead seat. The tray table is in the armrest, making the armrest immovable and slightly reducing seat width. There is no floor storage for this seat during take-off or landing. 1 D None No Power Seat 1 D is a Club Business Class Bulkhead seat. The tray table is in the armrest, making the armrest immovable and slightly reducing seat width. There is no floor storage for this seat during take-off or landing. 1 G None No Power Seat 1 G is a Club Business Class Bulkhead seat. The tray table is in the armrest, making the armrest immovable and slightly reducing seat width. There is no floor storage for this seat during take-off or landing. 1 J None No Power Seat 1 J is a Club Business Class Bulkhead seat. The tray table is in the armrest, making the armrest immovable and slightly reducing seat width. There is no floor storage for this seat during take-off or landing. 1 K None No Power Seat 1 K is a Club Business Class Bulkhead seat. The tray table is in the armrest, making the armrest immovable and slightly reducing seat width. There is no floor storage for this seat during take-off or landing. 12 A None No Power Seat 12 A is an Economy Class seat that may have limited recline. 12 B None No Power Seat 12 B is an Economy Class seat that may have limited recline. 12 C None No Power Seat 12 C is an Economy Class seat that may have limited recline. 12 H None No Power Seat 12 H is an Economy Class seat that may have limited recline. 12 J None No Power Seat 12 J is an Economy Class seat that may have limited recline. 12 K None No Power Seat 12 K is an Economy Class seat that may have limited recline. 13 D None No Power Seat 13 D is an Economy Class seat that may have limited recline. 13 F None No Power Seat 13 F is an Economy Class seat that may have limited recline. 13 G None No Power Seat 13 G is an Economy Class seat that may have limited recline. 14 A None No Power Seat 14 A is an Economy Class Exit Row seat that may have extra legroom. The tray table is in the armrest, making the armrest immovable and slightly reducing seat width. There is no floor storage for this seat during take-off or landing. 14 B None No Power Seat 14 B is an Economy Class Exit Row seat that may have extra legroom. The tray table is in the armrest, making the armrest immovable and slightly reducing seat width. There is no floor storage for this seat during take-off or landing. 14 C None No Power Seat 14 C is an Economy Class Exit Row seat that may have extra legroom. The tray table is in the armrest, making the armrest immovable and slightly reducing seat width. There is no floor storage for this seat during take-off or landing. 14 D None No Power Seat 14 D is an Economy Class Exit Row seat that may have extra legroom. The tray table is in the armrest, making the armrest immovable and slightly reducing seat width. There is no floor storage for this seat during take-off or landing. 14 F None No Power Seat 14 F is an Economy Class Exit Row seat that may have extra legroom. The tray table is in the armrest, making the armrest immovable and slightly reducing seat width. There is no floor storage for this seat during take-off or landing. 14 G None No Power Seat 14 G is an Economy Class Exit Row seat that may have extra legroom. The tray table is in the armrest, making the armrest immovable and slightly reducing seat width. There is no floor storage for this seat during take-off or landing. 14 H None No Power Seat 14 H is an Economy Class Exit Row seat that may have extra legroom. The tray table is in the armrest, making the armrest immovable and slightly reducing seat width. There is no floor storage for this seat during take-off or landing. 14 J None No Power Seat 14 J is an Economy Class Exit Row seat that may have extra legroom. The tray table is in the armrest, making the armrest immovable and slightly reducing seat width. There is no floor storage for this seat during take-off or landing. 14 K None No Power Seat 14 K is an Economy Class Exit Row seat that may have extra legroom. The tray table is in the armrest, making the armrest immovable and slightly reducing seat width. There is no floor storage for this seat during take-off or landing. 2 A None No Power Seat 2 A is a standard Club Business Class seat in the last row of the section where noise from the more crowded Economy Class may be bothersome. 2 B None No Power Seat 2 B is a standard Club Business Class seat in the last row of the section where noise from the more crowded Economy Class may be bothersome. 2 D None No Power Seat 2 D is a standard Club Business Class seat in the last row of the section where noise from the more crowded Economy Class may be bothersome. 2 G None No Power Seat 2 G is a standard Club Business Class seat in the last row of the section where noise from the more crowded Economy Class may be bothersome. 2 J None No Power Seat 2 J is a standard Club Business Class seat in the last row of the section where noise from the more crowded Economy Class may be bothersome. 2 K None No Power Seat 2 K is a standard Club Business Class seat in the last row of the section where noise from the more crowded Economy Class may be bothersome. 24 C None No Power Seat 24 C is an Economy Class seat that may be bumped into by service carts or others passing by due to the awkward configuration transition from 4 to 3 seats. 24 H None No Power Seat 24 H is an Economy Class seat that may be bumped into by service carts or others passing by due to the awkward configuration transition from 4 to 3 seats. 25 A None No Power Seat (SEATS}is an Economy Class seat that has extra legroom, however, this row is misaligned with the seats ahead, which some find uncomfortable. This seat may be preferable for those traveling with a companion, as this seat is one of the few coupled Economy Class seats on this plane. 25 B None No Power Seat (SEATS}is an Economy Class seat that has extra legroom, however, this row is misaligned with the seats ahead, which some find uncomfortable. This seat may be preferable for those traveling with a companion, as this seat is one of the few coupled Economy Class seats on this plane. 25 J None No Power Seat (SEATS}is an Economy Class seat that has extra legroom, however, this row is misaligned with the seats ahead, which some find uncomfortable. This seat may be preferable for those traveling with a companion, as this seat is one of the few coupled Economy Class seats on this plane. 25 K None No Power Seat (SEATS}is an Economy Class seat that has extra legroom, however, this row is misaligned with the seats ahead, which some find uncomfortable. This seat may be preferable for those traveling with a companion, as this seat is one of the few coupled Economy Class seats on this plane. 26 A None No Power Seat 26 A is a standard Economy Class seat. This seat may be preferable for those traveling with a companion, as this seat is one of the few coupled Economy Class seats on this plane. 26 B None No Power Seat 26 B is a standard Economy Class seat. This seat may be preferable for those traveling with a companion, as this seat is one of the few coupled Economy Class seats on this plane. 26 J None No Power Seat 26 J is a standard Economy Class seat. This seat may be preferable for those traveling with a companion, as this seat is one of the few coupled Economy Class seats on this plane. 26 K None No Power Seat 26 K is a standard Economy Class seat. This seat may be preferable for those traveling with a companion, as this seat is one of the few coupled Economy Class seats on this plane. 27 A None No Power Seat 27 A is a standard Economy Class seat. This seat may be preferable for those traveling with a companion, as this seat is one of the few coupled Economy Class seats on this plane. 27 B None No Power Seat 27 B is a standard Economy Class seat. This seat may be preferable for those traveling with a companion, as this seat is one of the few coupled Economy Class seats on this plane. 27 J None No Power Seat 27 J is a standard Economy Class seat. This seat may be preferable for those traveling with a companion, as this seat is one of the few coupled Economy Class seats on this plane. 27 K None No Power Seat 27 K is a standard Economy Class seat. This seat may be preferable for those traveling with a companion, as this seat is one of the few coupled Economy Class seats on this plane. 28 A None No Power Seat 28 A is a standard Economy Class seat. This seat may be preferable for those traveling with a companion, as this seat is one of the few coupled Economy Class seats on this plane. 28 B None No Power Seat 28 B is a standard Economy Class seat. This seat may be preferable for those traveling with a companion, as this seat is one of the few coupled Economy Class seats on this plane. 28 J None No Power Seat 28 J is a standard Economy Class seat. This seat may be preferable for those traveling with a companion, as this seat is one of the few coupled Economy Class seats on this plane. 28 K None No Power Seat 28 K is a standard Economy Class seat. This seat may be preferable for those traveling with a companion, as this seat is one of the few coupled Economy Class seats on this plane. 29 A None No Power Seat 29 A is a standard Economy Class seat. This seat may be preferable for those traveling with a companion, as this seat is one of the few coupled Economy Class seats on this plane. 29 B None No Power Seat 29 B is a standard Economy Class seat. This seat may be preferable for those traveling with a companion, as this seat is one of the few coupled Economy Class seats on this plane. 29 J None No Power Seat 29 J is a standard Economy Class seat. This seat may be preferable for those traveling with a companion, as this seat is one of the few coupled Economy Class seats on this plane. 29 K None No Power Seat 29 K is a standard Economy Class seat. This seat may be preferable for those traveling with a companion, as this seat is one of the few coupled Economy Class seats on this plane. 30 A None No Power Seat 30 A is a standard Economy Class seat. This seat may be preferable for those traveling with a companion, as this seat is one of the few coupled Economy Class seats on this plane. 30 B None No Power Seat 30 B is a standard Economy Class seat. This seat may be preferable for those traveling with a companion, as this seat is one of the few coupled Economy Class seats on this plane. 30 J None No Power Seat 30 J is a standard Economy Class seat. This seat may be preferable for those traveling with a companion, as this seat is one of the few coupled Economy Class seats on this plane. 30 K None No Power Seat 30 K is a standard Economy Class seat. This seat may be preferable for those traveling with a companion, as this seat is one of the few coupled Economy Class seats on this plane. 31 A None No Power Seat 31 A is an Economy Class seat where the close proximity to the lavatories and galley may be bothersome. This seat may be preferable for those traveling with a companion, as this seat is one of the few coupled Economy Class seats on this plane. 31 B None No Power Seat 31 B is an Economy Class seat where the close proximity to the lavatories and galley may be bothersome. This seat may be preferable for those traveling with a companion, as this seat is one of the few coupled Economy Class seats on this plane. 31 J None No Power Seat 31 J is an Economy Class seat where the close proximity to the lavatories and galley may be bothersome. This seat may be preferable for those traveling with a companion, as this seat is one of the few coupled Economy Class seats on this plane. 31 K None No Power Seat 31 K is an Economy Class seat where the close proximity to the lavatories and galley may be bothersome. This seat may be preferable for those traveling with a companion, as this seat is one of the few coupled Economy Class seats on this plane. 32 D None No Power Seat 32 D is an Economy Class seat in the last row of the plane that may have limited recline. The close proximity to the lavatories and galley may be bothersome. 32 F None No Power Seat 32 F is an Economy Class seat in the last row of the plane that may have limited recline. The close proximity to the lavatories and galley may be bothersome. 32 G None No Power Seat 32 G is an Economy Class seat in the last row of the plane that may have limited recline. The close proximity to the lavatories and galley may be bothersome. 8 K None No Power Seat 8 K is an Economy Class seat that is missing a window. 9 A None No Power Seat 9 A is an Economy Class seat that is missing window. 9 K None No Power Seat 9 K is an Economy Class seat that is missing window. Air Transat offers a wide variety of audio entertainment. On flights lasting over two and a half hours, Air Transat offers newly released movies and a broad selection of videos. 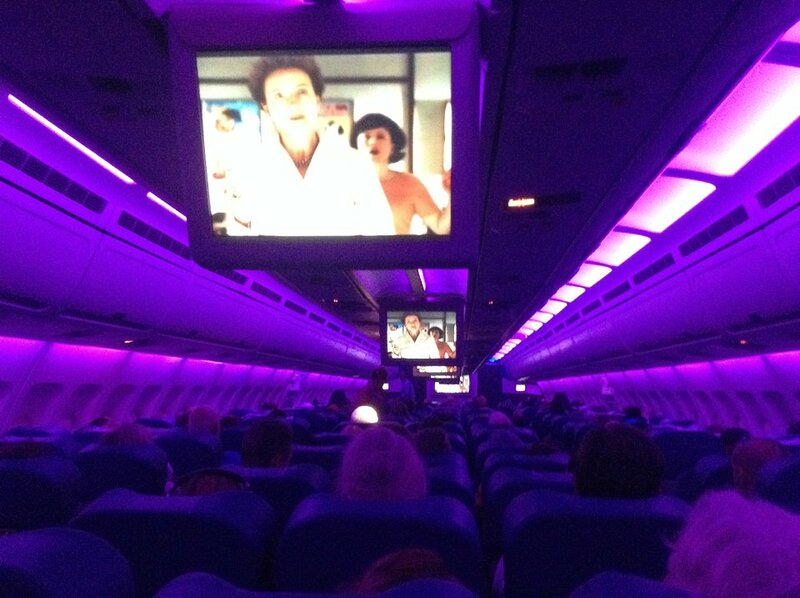 This aircraft features video screens at all seats in the Club Section and 6 shared screens in the Economy Section. There are shared video screens located at rows 1, 4, 11, 15, 18, 20, 26, and 29. All seats in Club have access to AC power outlets and USB ports. There are no AC outlets or USB ports in Economy. This Airbus A310-300 has 244 seats in a two-class configuration. There are 12 seats in Club Class and 232 seats in Economy Class. Club is Air Transat's Business Class. The front frow of club class has nearly no overhead storage. There is storage for the seondd row and since there are only 12 people in the club class this may not be a problem but it is annoying to have your bags farther back. Since the front row has no underseat storage it is additionally bothersome. The seat is directly under the loudspeaker that sends announcements to half of the economy class. It is extremely loud. Awful seat that has no recline at all! This seat is a full 4cms narrower than either seat 4I or 4K. It has no legroom at all as there is a 20cm panel in front of the seat and the passenger has to straddle their legs into the foot area for adjoining seats 4I and 4K. There are no individual TVs in these seats. The three passengers in seats 4I, 4J and 4K have to share the single cabin-level TV high up in the cabin (impossible). Seat 4J being 4cm narrower than the other seats is like a small, child seat. The flight was so unconfortable I was in tears on arrival and I am of small build. I paid extra for this seat which was sold as having 'extra legroom'. I am small but seat is extremely narrow due to imovable arm rests. Very, very narrow and dreadfully uncomfortable. Regret having paid extra. No legroom either. These seats are a premium as they are two by two and have a little extra leg room. We found them comfortable for the price of the ticket. Still economy though! The Club Class seats and service were very good. I went to see some friends in the back and was very surprised to see how little room there was. Worst ever journey. These seats are incredibly narrow and with an overweight passenger beside me who insisted on trying to read a newspaper, it was the most uncomfortable I have ever been. There is more space on a subway seat. Tighter than any plane I've flown. Never again. I'm 5'10, slim and there was no room to move my legs or arms. Due to the curve of the plane, I must've hit my head at least 15 times. Ugh. If the person in the seat in front of you reclines, there is no room to leave your seat to exit to the aisle or bathroom. While the legroom is good, there is no space for your body to stand up and exit. Also, as there is only a short curtain separating you from economy class, and the row behind you is reserved for infants, there is a strong chance of having a baby sit behind you, which can be irritating when they cry during the flight. I dislike Airbus and particularly the A310-300. Noisy. And I always feel like a steer in a cattle liner going to market in these wide bodies. I'll take a single aisle anytime. Returning from Glasgow, I chose the aisle seat so I could get up without bothering anyone. Yes, I did appreciate the extra legroom & would purchase again, but the heavy curtain separating 'club class' was definitely in my space & was annoying. And when anyone passed through it, I got bumped as well as brushed with the curtain. Wish I had gone with the window seat 4K I had on the way over. Glad I paid for the extra legroom! I could stretch out, lean on the window & actually slept! Very narrow seat though - the lady beside me was a bit large so I was lucky I could lean towards the window as she took some of my space. Wider seat. I still got bumped a little despite the wider aisle but would pick that seat again. We had seats 4B&C - the width was terrible. I am not obese in any way and my daughter is a size 4 and even she was not comfortable. Extra legroom is good but the seats are so narrow it makes for a VERY uncomfortable flight. And these are seats you pay extra for. Not worth the extra $ at all. Selected and paid for seat from A320 seat plan.Get on plane and it is an A310.Cattle car would be an accurate description.Narrow aisles and woman behind me who used back of my seat to pull herself up made for 7 hrs in Hell.Have already sent my opinion to Air Transat. The seat pitch wasn't as bad as some I've been on but the width was awful. I was in an aisle seat but the fact that the woman in the next seat was quite fat meant that I spent the 7.5 hour flight leaning into the aisle, getting bashed everytime someone walked past or a trolley came past. Awful seating that squeezes passengers in like sardies. A great example of why economy is called cattle class. One of the best seats on the plane. Air transat has squeezed 9 seats across into a plane designed for 8 seats across. The width was too narrow and I felt very claustrophobic. Also I paid for aisle seats and finished up with a b seat. The worst flight I have had for ages. Calgary to Punta Cana. 24A has a chunk of the seat back/headrest shaved off so that it fits behind a fuselage rib. This is where the fuselage narrows into the two seat config. Your shoulders will be wedged between the rib and the passenger in the middle. Flew with my brother, both of us have wide shoulders. Took turns leaning forward the entire flight. Flying Club Class you can expect great comforts. Flying economy is another story. The lovely new planes are extremely cramped for anyone over 6 foot. I am 6'2" and it was impossible to remain seated if the seat in front of me was at all reclined. Thankfully the crew understood that it would be unlikely that i could remain standing for the whole trip, and they found an exit row for me. I have been comfortable in seats with a 32 pitch (as per seatguru) Not the case with AT! Transat have done a great job of upgrading their cabin, and the legroom was amazing. However, the width of the seat was the only let down. Very tight inspace, and even the small lady sat by the window was cramped. I flew club class on the return and couldn't fault the flight in any way. I am flying with Air Transat again in October and have upgraded to club class again. Totally worth the extra money. Now I know what its like to be in a straight-jacket. No leg room, no elbow room and no stomach room (and I'm slim). Air Transat and CorsAir must be using the same plane by painting the outside just before boarding. Food was lousy, service was lousy and it took an eternity to get home (8 hours from France to Montreal). 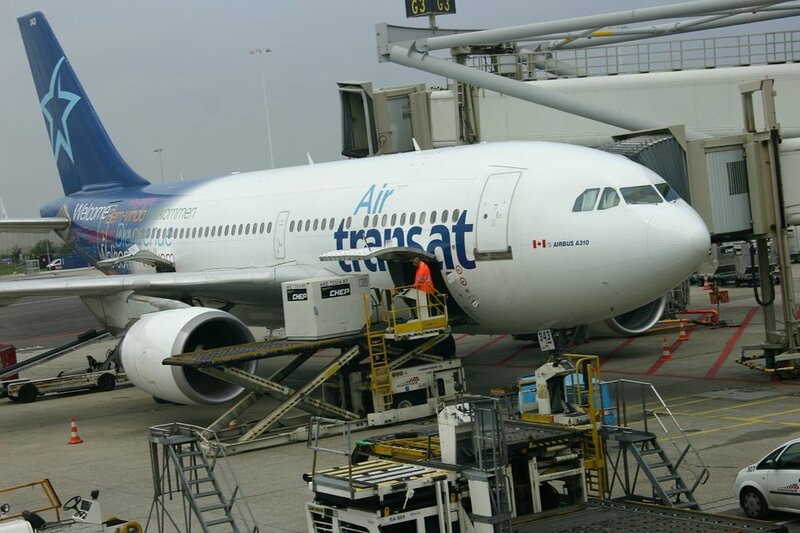 Bye, bye Air Transat. Air Transat flies 1 versions of Airbus A310-300.